Our challenge is to maximize the cash flow of savings from the installation of sensors and lighting upgrades. In every comprehensive project, these quicker payback measures support capital expenditures that would not otherwise justify themselves. The graphic below illustrates the effect that each measure has on the Contract Term cash flow. The Target payback period drives the financial analysis making the comprehensive project viable. when we can provide you with the whole tree? 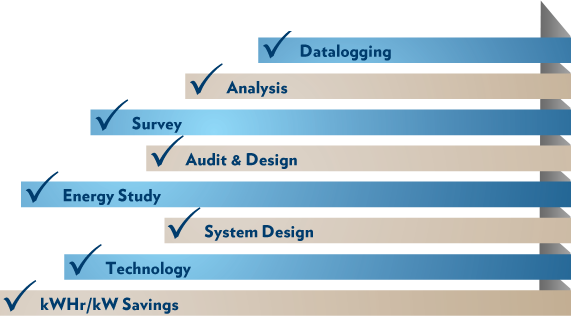 PES provides a customized and comprehensive project, using all the data collected rather than cherry picking certain areas Our approach is thorough and holistic; we won’t leave an opportunity for savings uncovered. We optimize every part of the project, servicing the client’s full needs instead of choosing the quickest and most obvious solution. Our solution is simple: we guarantee performance throughout the entire project. PES provides reliable implementation by working together with our customers to develop sensor and lighting designs that meet the facility’s needs. Our focus is on improving the overall quality of the building, while reducing energy costs and enhancing the facility’s atmosphere. We deliver user convenience, flexibility, and satisfaction. "We guarantee kWHr/kW savings per the dollars invested based on monitored and approved data. System performance is guaranteed."